Question, are the goals realistic? Maybe just maybe can we be a bit too realistic ? Realism being just another name for incrementalism /limiting our imaginations/ pruning our dreams?Why not once in a while just take that leap in faith ? Maybe we would surprise ourselves with our abilities. 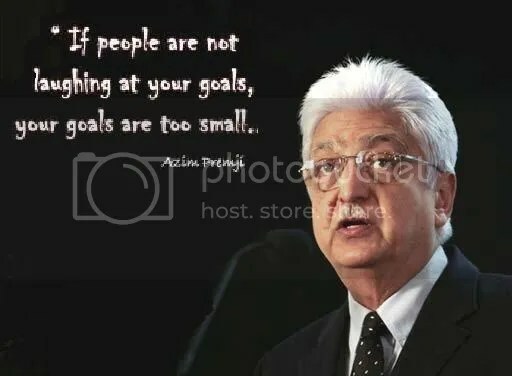 I don’t think the man is all hogwash……..his belief converted the resources of an edible oil company to Wipro which today exports software services,makes bulbs,soaps,baby products,computers,treats waste water etc.etc….And Wipro was not always Wipro and not everyone agreed that everything he set out to do was doable.